It is great to see when traditional media takes on some of the ideas we got to understand as de-facto standards in the new media world. One of the things that until a few years ago was unthinkable is to allow third parties to display your precious data. This has changed now and more and more traditional content providers start seeing the benefit of providing their information in easy to digest and reusable formats. The first step in this direction was offering RSS feeds and the BBC were probably one of the first to do so. However RSS feeds still mean that you can only get the newest content rather than being able to dive into the archives or request and retrieve specific data. 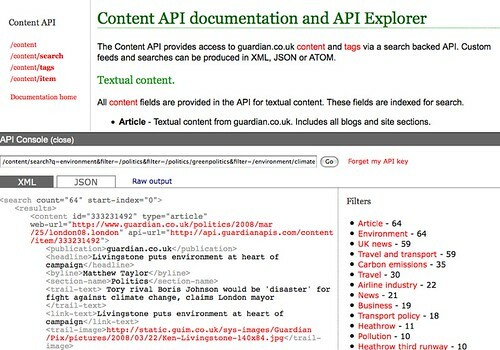 Last year the New York Times upped the ante by providing their content APIs and now the Guardian step up and deliver their content in a newly released content API complete with an API explorer and very simple access channels. The other big thing the Guardian announced today is the data store, a repository of Guardian research data in spreadsheet format. The quality and simplicity of the API is not surprising if we consider the people behind the project including Simon Willison of Django fame. I’m excited about this new data repository on the web and to make it easier for you to access the information we’re working on setting up open data tables for YQL to allow you to mix and match the Guardian information with other services. I’ve created one of the demo apps shown at the Guardian press conference this morning and will release an in-depth how-to at my blog soon. Of all the major UK papers I’m not surprised the Guardian is the first to do this. Their online content continually wins awards and I have vague recollections of them having something similar to this on a much smaller scale (I think it let you get major stories) in 2001-ish.